We know that many great companies, corporations, and businesses enjoy an annual holiday party to thank its great employees and have a fun, relaxing time. Hey! 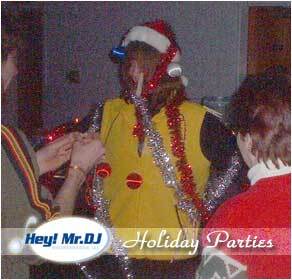 Mr. DJ puts the focus on the people who make your business tick - the employees - and has a great time doing it! Our favorite corporate events are the holiday parties and banquets. People are always in a great mood around this time of year, and Hey! Mr. DJ will feed off that. We provide the perfect mix of music, interaction, dancing, and games to make your holiday party memorable! Past clients, referrals, and recommendations can be provided upon request. We strive for individual attention, and pride ourselves on our attention to detail. Let us know about any special themes or activities associated with your holiday party, so that we can provide the best service and ideas to you. We can help you create anything.